If you only have space to grow one fruit tree grow Stella Cherry! If you only have space to grow one variety of fruit tree, grow this one! 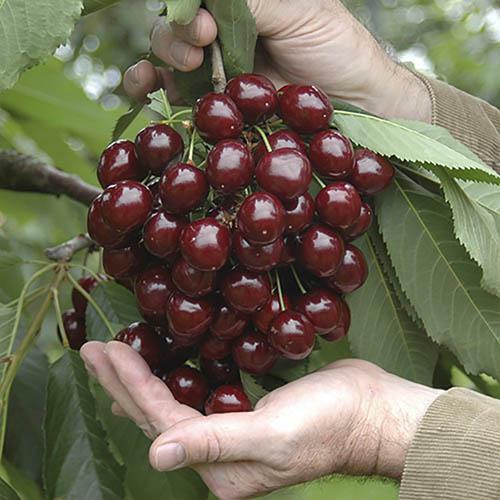 'Stella' Cherry is 'Self-Fertile' (which means it does not need a second variety of cherry tree to pollinate it) and is a really heavy, reliable cropper because it has good resistance to late frosts. Unlike most other sweet cherry varieties, it will thrive in slightly exposed locations but can also be grown in a pot on your patio. The sweetly flavoured dark-skinned, plump and juicy, aromatic fruits will be ready to pick from mid late July each year and from the third growing season onwards you can expect upwards of 5kg (11lbs) of sweet fruits per tree, which will save a small fortune compared to paying supermarket prices! Additionally, the beautiful Cherry Blossom which appears from early March, will brighten your garden and mark the beginning of spring. Our grower quality multi-branched bare-root trees have been grafted on to 'Colt' rootstock to provide a compact and manageable habit which in this case will reach approx. 2m (6-7 ft) tall.